The Fisk Jubilee Singers are historically reputed for arranging and utilizing spirituals in attempts to raise money for their financially destitute school. While the group was originally assembled in 1871 by George White, later pioneers such as John Wesley Work II would continue to develop the group in efforts to raise money and promote the artistic value of the African American spiritual. 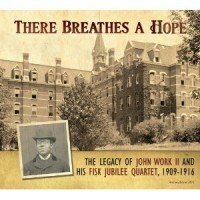 There Breathes A Hope is an album that chronicles the development of the Fisk Jubilee Quartet under Work’s tutelage. Hope features a collection of 43 extant recordings done by the Victor, Columbia, Edison and Starr recording companies. Organized into a series of “mini” concerts spread over two discs, Hope allows the listener to witness the diversity of the quartet’s early repertoire. While the majority of the songs are arrangements of African American spirituals, this album also features four recitations of poetry written by Paul Lawrence Dunbar and performed by second tenor James A. Myers. Selections like “When Malindy Sings” and “In the Morning” showcase his incredible ability to breathe life into the words of the illustrious poet. Another notable feature of this collection is the vocal contribution of celebrated tenor Roland Hayes on the Edison recordings. Hayes distinctive voice can be heard singing lead on several of the songs including “My Soul is a Witness.” Within this compilation, there is also indication that certain pieces were recorded for multiple recording companies. For instance, “Swing Low Sweet Chariot” and “Shout All Over God’s Heaven” are included several times but each rendition showcases a different group of singers. This feature highlights which songs were particularly popular and well-known by this group, while also allowing the audience to observe the manner in which the same song may have varied from one recording to another due to changes in quartet personnel or technology. Hope is a particularly important reissue because it moves beyond offering quality recordings to sharing a wealth of information about the history and work of John Work II and the Fisk University Jubilee Quartet. Firstly, the album is accompanied by a booklet that contains an extensive historical treatment of the development of the Fisk Jubilee Singers, the quartet, and John Work II’s tenure at Fisk authored Doug Seroff (and nominated for a “Best Album Notes” Grammy Award). Secondly, intermixed with the songs are excerpts of interviews that Seroff conducted with Jerome I. Wright, one of the last surviving individuals to train with Work at Fisk. Although Wright matriculated through Fisk a few years after these recordings, he provides valuable insight into the music and life of the quartet under Work’s direction. This collection is an invaluable resource of musical materials that were significant to the development of American music. While good sound quality allows the listener to appreciate the quartet’s well blended harmonies and overall musicianship, the essay and liner notes offer useful contextual information. There Breathes a Hope provides a rare opportunity to engage with a musical legacy that is relevant in the present day.